*This post contains affiliate links. This post also contains sponsored content Dolly Parton’s Stampede Dinner Attraction in Pigeon Forge, Tennessee. All content and opinions are my own. Dolly Parton’s Stampede Family Friendly Dinner Attraction in the heart of Pigeon Forge, Tennessee. We visited the Smokies at the beginning of Spring and we attended Dolly’s Stampede dinner show and it was so fun! The entertainment is fun for adults and children alike! This attraction isn’t just a dinner show. By showing up early you can visit the horses in their stables before the show starts! The horses are all beautiful breeds of Palomino and Quarter Horse. It was really fun for my kids to see the horses up close because they could point out their favorites during the performance. The kids were so excited because, after the show, they had the opportunity to meet the horses and their riders – they even got to pet them! You can also get autographs from the riders if you wish! Upon entering the Stampede show, we were welcomed by very friendly greeters in costume. The lady was interactive with our children and gave us a very warm welcome. Before the show starts, there’s an opening act called Mountain Ruckus. It’s bluegrass and country band with great talent. It’s not all bluegrass and country though, they’ll also entertain the younger generation with some familiar music to them as well! Performing with Mountain Ruckus is 4-time National Banjo Champion, Gary “Biscuit” Davis. He started playing at the age of 10! He has amazing talent and has even performed with Dolly Parton, herself! The opening act also has a way of getting the children involved and it’s a lot of fun! I’ll keep that a secret because it’s really cute and the kids really enjoyed it! Alcohol is not served at Dolly Parton’s Stampede Dinner Attraction but there are soda and snacks sold before the dinner show. There’s even a Saloon Special that includes tasty drinks and a large popcorn. It’s perfect for the opening act and is enough to hold the kids over until dinner is served. The Dolly Parton Dinner Show Attraction is engaging, fun to watch, and there’s even some humor and magic! If you’ve ever taken kids anywhere you know that it’s hard to get them to sit still, especially during dinner! This show gives opportunities for children and adults to cheer on their team as well as stomp their feet to the word, “stampede.” The kids love to watch the birds, buffalo, chickens, pigs, and of course the horses! Shortly after the opening act, dinner is served. Before the show starts, you order your drinks you can let your server know of any allergies that may be present. Dinner is served in batches, first the starters, then the main courses, and the sides coming last. Towards the end of the show, dessert is served. The servers stay on top of drink refills and they’re all very kind and pleasant to talk to! There are many acts in the dinner show and they’re all entertaining and engaging. There’s fire, lighting effects, races, dancing, and a lot of rooting for your team to win! A performing act of your Native American Heritage. A rider on two horses jumping through flames. The announcer/performer narrating the show. Actors and actresses preforming a dance. Riders performing a choreographed act hiding horses. 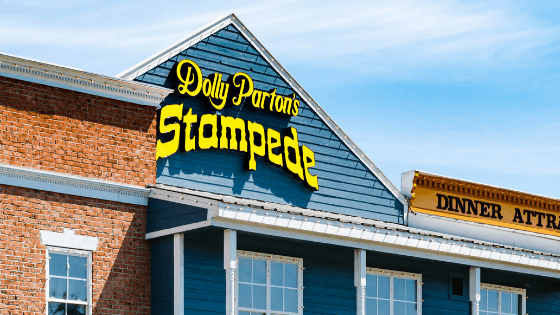 The Dolly Parton Stampede Dinner Attraction is conveniently located on the Dolly Parton Parkway and is located close to Dollywood and is just a few minutes away from Gatlinburg and other fun family-friendly activities. You can check out their website here for more show information and show dates and times.